Six years ago today, Terrie Bowles started with Anglo. Terrie started as a shy Receptionist and worked her way up to become a successful Recruitment Consultant for the UK Water and Wastewater industry. 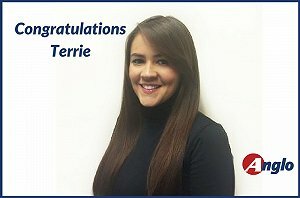 We are very proud of Terrie since her professionalism embodies the company philosophy and her hard work is a prime example of how employees can further their careers in our organisation. By bringing her positive attitude to work every day, projects become easier to execute, changes become easier to implement and problems become easier to solve. Thank you Terrie for showing all of your colleagues that the pursuit of excellence is the best way to climb up the organisational ladder in Anglo Technical Recruitment. Anglo management congratulates you on your success, and wishes you all the best for your future at Anglo. Well done.